One of the premier ski destinations in Vermont, Mount Snow is located on Vermont Route 100 in West Dover, in the Green Mountain National Forest—perfect for seasonal and permanent residents alike! Mount Snow is within easy driving distance of some of the East Coast's most popular cities, including New York City, Boston, Providence, Hartford, and more. Fine and family-style dining, as well as retail shops, are readily available right at the base of the mountain and throughout the Deerfield Valley, and a short drive takes you to Manchester, Vermont, known for its designer outlet shops, restaurants, terrific independent bookstore, and cultural activities. 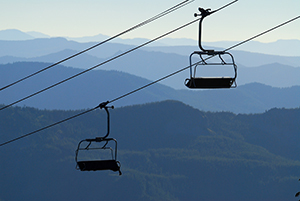 Skiers and snowboarders enjoy 3,600 ft of elevation and a 1,700 ft vertical drop. If tearing up the slopes isn’t for you, enjoy the Tubing Park or snowshoeing, cross-country skiing, and snowmobiling. In addition to skiing and snowboarding at Mount Snow, the VAST snowmobile trail system runs throughout the Deerfield Valley – a region of Southern Vermont that offers wonderful real estate opportunities for seasonal visitors as well as permanent residents. Discover what events are now happening at Mount Snow! Every year, Mount Snow attracts visitors to events like Tough Mudder New England, the Marlboro Music Festival, the Deerfield Valley Blueberry Festival, Mount Snow’s Bike Festival, the Annual Vermont Blues Festival, and the Deerfield Valley Farmers Day Fair. Lake Raponda, Harriman Reservoir, and Somerset Reservoir are destinations of beauty. After visiting our real estate office, take a ride in your canoe or kayak. Take in the beauty of Mount Snow, especially after a hike to the top! Mount Snow is a great place to call home, whether you are vacationing or looking for your year-round Vermont home. From mountainside condos to luxury homes, the area provides many options. Whatever it is you’re looking for, TPW Real Estate can help you make your Mount Snow real estate dreams come true! Have questions? Contact us - the TPW Real Estate Team has very deep roots in the Mount Snow area and would love to help you with all of your real estate needs anywhere in the area or throughout South and Central Vermont.